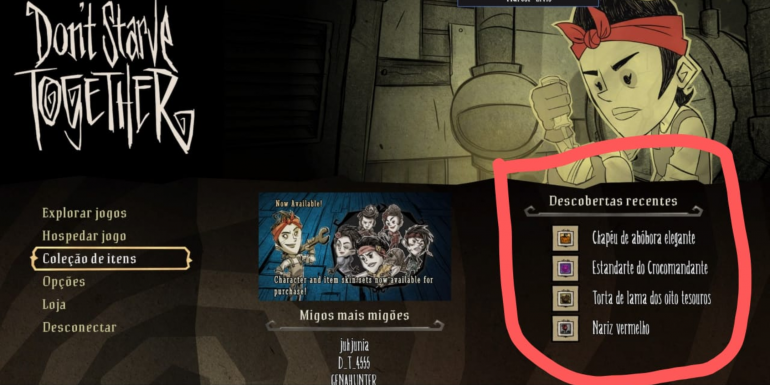 Klei should have turned off the skin drops from Winter's Feast and Earlier, this is what I was worried about because the icons are more likely to drop than normal common skins. maybe have the icons lumped in with the normal drops? i mean what has more value a shirt or a icon that only appears if you talk? Sure, i prefer wining some commons skins because you can, at least, trade them in tarde inn. But finally, you can weave your icons to make some spools (and bye some new skins with) and, well, you can have 8 drops and 7 daily ones, so, more chances to have at least one good drop (like elegant). Better than before. I think they have done this on purpose to discourage skin farming and trading among players with multiple Steam accounts and allow free2players to unravel for spools since icons are worth the same as common skins. This way it's more likely to drop skins that cant be traded and sold. This is most likely intentional on Klei's part to encourage us to spool the drops in preparation for weaving Wortox when he comes out. Though yeah, after Wortox's release please change the drops back to what they were before (No more event items PLEASE! If they were gonna be dropping like this though you coulda at least thrown Gorge in there.). I think they made it to balance the chance of good drops. By the way, I still am unable to understand why there STILL are event item drops. These were supposed to be event-exclusive items, only available on the time of the event. So why leave them? These items were a very nice and convenient proof for participating in event, now everyone can buy these goodies and fake their participation and loyalty. Because HN, Forge, WF were clumped together. I don't see how their "mergment" is relevant to the fact that limited-time event (Forge, luckily not Gorge) drops are still, well... dropping. But I can see that you somewhat agree with me, in 20%. That makes me 20% happier. In theory all skins quality chance is bigger. But after adding icons and rest curios (except characater skins and belongings) gifts are similar to earlier quality chance. I think profile icons exclusion (only profile icons) should help and fix all. so, what is obtainable actually ? Hallowed Nights/winterfest drops (like holloween suits or winter hat?) ? what about varg or pig years ? (i had a lunar collection drop this morning). oof, I feel your pain. All I got for a while were profile icons and backgrounds, but I think we're just being unlucky. Like yesterday I got the robot dance, which I guess is pretty cool. Right now? Everything but Gorge. Everything but Year of the Gobbler and Gorge. I still think profile icons and backgrounds were unnecessary padding to the drop system, and don't really serve much of a purpose. But I guess spools are spools. Did anyone get a Year of the gobbler skin? If no then that doesn't drop too. It kind of makes sense, though. 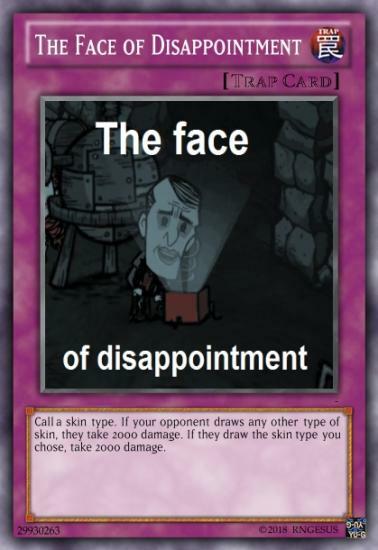 What if a player is new to DST and really likes the game and starts playing alot? Then this is their only chance of getting the nifty icons from the past events that they missed out on (even if it won't be as nifty for a person who already has them all). It might be the rationale. And you still can convert them to spools without messing with current economy, in contrast of getting items that are unravelable and marketable (a big drop rate of those probably would have led to an influx of item farming and flooding of the Steam Market now that there is an upper limit of 15 weekly drops). My proposal that would not over-dilute the skin pool but allow new players to get icons, backgrounds etc. would be to make the original Forge event icons, vignettes, backgrounds and some of the other stuff from that event not part of the Forge collection because most of that stuff has nothing to do with the Forge at all. That way we aren't getting flooded with icons but new players can collect them and customise their profile without ruining what was special about the event items to begin with. Does anyone actually know why all those icons and backgrounds depicting stuff from the Constant were made part of the Forge collection in the first place? I have personally never understood it because they are completely unrelated, and now that the classic Winona skins are weavable we know that they don't need to be part of an event set at all to use the spool system. Guys do you know that the skin rarity gets chosen first though? Profile icons and portraits were added in first Forge update. Before there was only character and item skins. And some emotes.